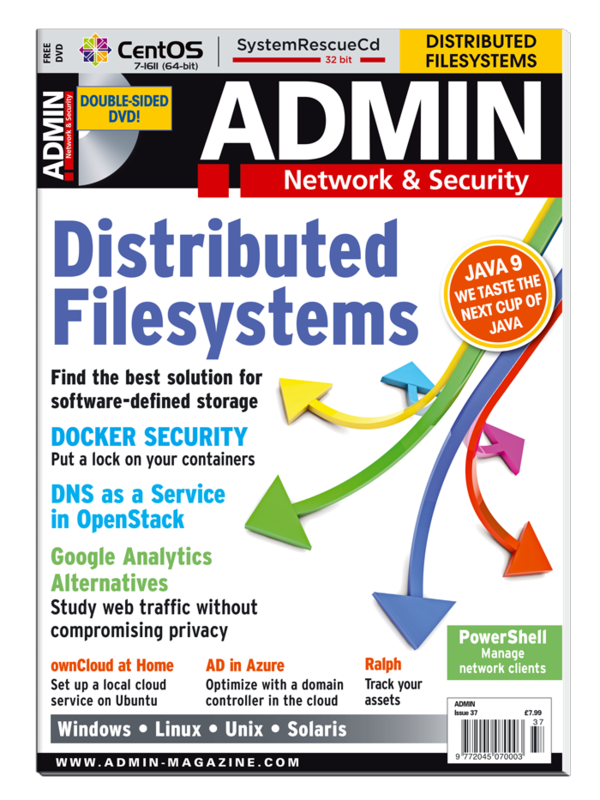 This issue focuses on how to collect website statistics and exchange files in the cloud, all with an eye on security. News: openSUSE Leap in Windows 10; Raspberry Pi Compute Module 3; PHP7 and Android security problems. The theme for 2016 was "Define Your Future". We looked at some useful alternatives to Google Analytics that don't ignore your privacy concerns. Create a database monitoring solution using openITCOCKPIT to keep tabs on applications and their performance. Learn how to set up an ownCloud 9 environment on Ubuntu 16.04 LTS for secure file exchange in the cloud. OpenStack Designate is a meaningful and well-functioning DNS as a Service implementation for managing DNS entries in the cloud. A benchmark shows which distributed filesystem is best for handling softwaredefined storage. PowerCLI in the current version 6 R3 supports access to nearly all VMware data center and cloud products with around 500 cmdlets. Containers introduce serious security problems, but you can employ a number of methods to deploy them securely. Putting an Active Directory domain controller in the Azure cloud. Dividing or grouping network resources into logical units independent of the physical layer is typically a matter of implementing secure strategies. We show you the underpinnings of virtual LANs. As IT infrastructure grows more complex, IT asset management tools become essential. One promising newcomer is Ralph. The Open Linux Management Infrastructure is looking to establish a standard approach for configuring systems based on different Linux distributions. Opsi simplifies automated software installation in large computer networks. Java 9 tempts programmers with innovations intended to facilitate the development and operation of Java applications. Key recovery agents let users set up vaults, where they can store all sorts of data safely. Protect yourself against unauthorized access to your phone.